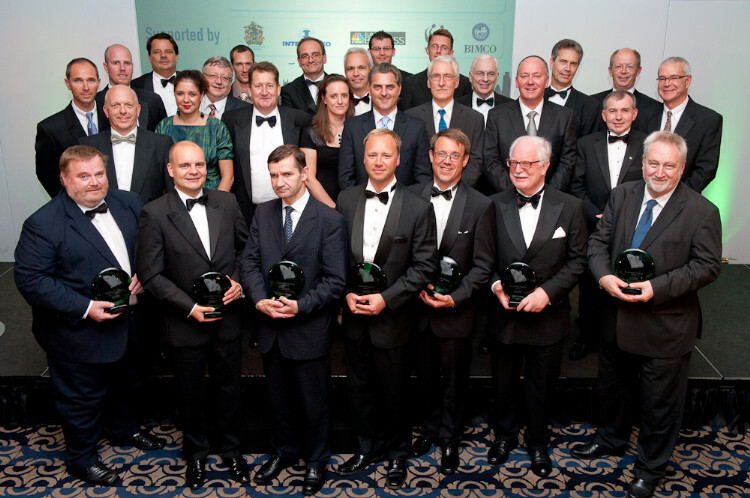 Funnel's submission (titled The Funnel Vision) to the inaugural Sustainable Shipping Awards, London, July 2009, was shortlisted for Green Shipping Initiative of the Year . Attended by representatives from over 100 leading maritime organisations from around the world, the Awards were contested across 6 different categories. This letter is to express Prime Carbon's support for and interest in the Funnel Program about which we have spoken today. Prime Carbon exists to provide a practical link between those who must necessarily create emissions of CO2 and those best placed to capture CO2 from the atmosphere. In practice this means creating a linkage between consumers of energy and producers of food and energy from the soil - meaning farmers and landholders. We are therefore very much interested in exploring the provision of Removal Unit (RMU) offsets or other Carbon Credit Units (CCU) generated from Land Use, Land Use Change or other activities on farms which result in the capture of carbon from the atmosphere. It is perhaps significant that a number of those farmers who have chosen to participate in Prime Carbon programs for soil enhancement and carbon sequestration are also participating in the generation of renewable energy through growing crops for bio-fuels and the recycling of bio-mass. We believe therefore that the linkage you have suggested between shippers, bio-fuels and carbon sequestration to soils provided a win-win solution to a number of social and environmental issues and we would be delighted to explore participation. MBD Energy Limited is an Australian firm that is focussed on the development of algae based biofuels and food for livestock. As you are aware, algae biofuels offer a great opportunity to shift the world economy away from fossil fuels and into a mass volume fuel stock that does not increase the net concentration of CO2 in the atmosphere. We are currently in the process of significantly expanding the production capacity of our Test Plant which is located in Townsville, North Queensland and was launched by the Premier Anna Bligh in May 2008. We are also pursuing large scale commercial projects at several of Australia’s largest CO2 emitter sites (including one in Queensland) for the commercial production of algae based biofuel and food for livestock. As discussed, we are still several years away from supplying the volume of bio-bunker fuels required to fill ocean going freighters. However, within the coming months we will have available the necessary volumes of fuel for sea-trials on a tug boat or some other vessel as discussed. 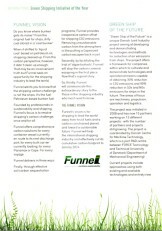 We would be very happy to work with Funnel and your contacts in the shipping industry to perform a trail of our fuel. The Great Barrier Reef Marine Park Authority (GBRMPA) is the principle adviser to the Commonwealth Government on the conservation, care and utilisation of the Great Barrier Reef Marine Park. The Australian Government, through the GBRMPA is implementing the Great Barrier Reef Climate Change Action Plan 2007-2012 (Action Plan). The Action Plan outlines objectives of the response to the threat of climate change for the Great Barrier Reef. One of the objectives of the Action Plan is to assist Great Barrier Reef dependent industries to reduce their climate footprint. The Great Barrier Reef Marine Park Authority supports best practice climate change mitigation actions for the maritime industry conducting business in the Great Barrier Reef Marine Park. 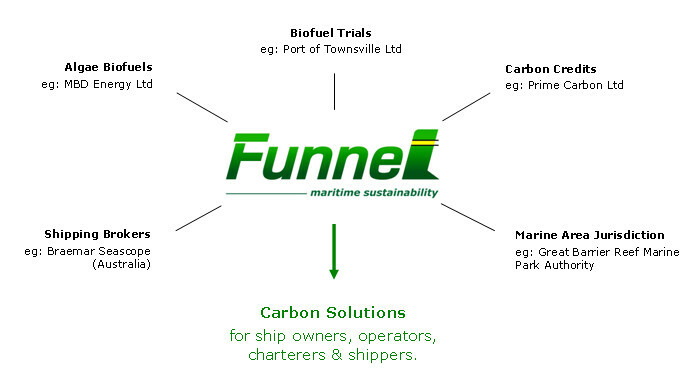 The Funnel project and trialling of algae biofuels in marine engines proposed by Mr Lane is an innovative proposal that may assist the maritime industry in reducing greenhouse gas emissions. We are interested in learning more about this initiative and following its progress. Port of Townsville Limited (POTL) manages the Port of Townsville – a breakwater harbour with nine operational berths – with a land and sea jurisdiction in excess of 400 square kilometres, bordering the Great Barrier Reef World Heritage Area. The Port of Townsville, Queensland, Australia's third largest commercial port, plays a vital role in the regional economy – providing all of North Queensland with a world-class gateway for commerce and trade. Over ten million tonnes of high value bulk, break bulk and general cargo pass over its wharves each year. POTL has long recognised the value of sustainability principles and established an environment park in the early 1990s dedicated to the growth of a range of vegetation including tall timber. This was subsequently expanded to 8ha in the 2000s, providing a high quality natural spot for use by the local community and a natural habitat for native plants and animals. The park is on reclaimed land with high salt content and low nutrient value. In addition to its aesthetic value, the park provides a spatial separation between neighbouring residents and port land, and contributes substantially to offsetting the carbon emissions from the Corporation's light vehicle fleet. POTL has an active environmental department and the Corporation is continually seeking new ways to manage our environmental footprint. As part of our continual improvement program, POTL has also established a sustainability working group charged with identifying, prioritising and implementing sustainability initiatives to meet objectives provided in our sustainability policy. Some of our key initiatives include the use of cleaner fuels, reduction of energy use and a strong focus on overall reduction and recycling and reuse. POTL has recently purchased its first hybrid truck for inclusion in its fleet. It is understood that this is the first such truck to be operated outside of a capital city. POTL understands that biofuels play an important part of a sustainable fuel strategy for any organisation. It is understood that the gradual conversion from fossil fuels to bio fuels needs to be undertaken with full due diligence and proper process. We are committed to this conversion wherever possible. To this end, we are happy to continue discussions with Funnel regarding the potential benefits of the use of algae biofuels in our maritime operations. We look forward to further communication on this matter. Braemar Seascope is a leading integrated provider of broking and consultancy services to the shipping industry. We offer a broad range of broking services across all major shipping markets. Headquartered in London, Braemar Seascope has offices in Melbourne, Aberdeen, Beijing, Shanghai plus interests in Mumbai, New Delhi and Singapore. With our international shipping reach and market intelligence, we are aware that the maritime industry is addressing sustainability issues relating to carbon emissions. We have been informed recently that Funnel has developed relationships with specialists that can facilitate the mass production of algae bio-fuels, plus equivalent expertise in the provision of soil carbon sequestration programs and carbon credits. Funnel seems to have well-established links and broad reach across the spectrum of the shipping industry. To this end, Braemar Seascope is interested to learn of the developments of this technology. Wishing you the best in London, July, 2009 at the Sustainable Shipping Awards and we look forward to meeting you in Melbourne for an update in the near future. Regards: Nigel Corben, Business Development Manager.